DUAL DISPLAY pH/mV & TEMP.! Dual LCD display shows pH / oF & oF or mV / oF & oF. 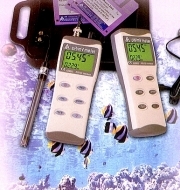 Automatic Temperature Compensation assures that all readings are corrected to compensate for the effect of temperature. Hold, Max / Min, Record features. Manual temp. compensation with external probe. Calibration up to 3 points (pH 4.00,7.00,10.00)and manual. Optional RS232 software ( Disk & PC cable). mV accuracy : <0.2mV( <0.1~195.0) or <2 mV ( <190~499). Auto power off after : 20minutes. Disable mode. Input Impedance : 1012 ohms. ( pH electrode ) AZ86P2-Epoxy-body w / o ATC.